Randolph Barnes Marcy was an officer in the United States Army, chiefly noted for his frontier guidebook, the Prairie Traveler, based on his own extensive experience of pioneering in the west. This publication became a key handbook for the thousands of Americans wanting to cross the continent. 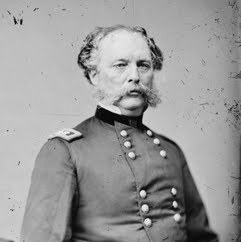 In the Civil War, Marcy became chief of staff to his son-in-law George B. McClellan, and was later appointed Inspector General of the U.S. Army.